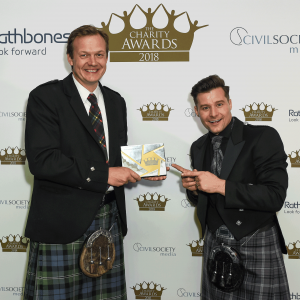 The care charity was picked as the overall winner at The Charity Awards 2018 by this year’s judges from a total of ten category winners. It also won the top prize in the Campaigning and Advocacy category. The charity was set up to campaign for radical change to the Scottish care system to tackle negative outcomes for children in care. There are currently 15,000 children in care in Scotland. Despite care leavers making up just 1.5 per cent of the population, they account for a third of all prison inmates. Only 4 per cent go to university, compared to 39 per cent of their peers. Almost half have mental health issues, and almost a fifth are homeless within five years of leaving care. All of this is despite the state spending almost £100,000 a year on the care of the average child. The charity began its campaign after finding that after politicians heard the voice of service users who had been through the system, they had been willing to commit to immediate and radical change in the laws. The charity had already won changes in university funding, increases in the age of leaving care, and abolition of council tax for young care leavers, but it believes that these are only stepping stones on the road to a complete reorganisation of the whole system. Judges were impressed with many aspects of the Who Cares? Scotland’s work, particularly how service users’ experience was central to the charity’s hugely successful programme. The charity’s user-based approach convinced leaders in all major political parties in Scotland, including First Minister Nicola Sturgeon. Last year, Sturgeon announced at her party’s conference that she would be launching a root and branch review of care in the country, the first time the entire care system has ever been redesigned, and the largest review of care in 150 years, in any country, across the world. Andrew Hind, executive editor of Civil Society Media, said: “Who Cares? Scotland has achieved considerable changes, and has done so in an innovative and effective way. “There were many things to admire about their work winning change in the care system in Scotland, but what impressed the judges most of all was their complete commitment to putting the service user at the heart of their work, and their refusal to accept anything less than the best for their beneficiaries. Accepting the award, Duncan Dunlop, chief executive of Who Cares? Scotland, said: “Care experienced people are a silenced community. They are the most oppressed community that we currently have. We give them their voice, we enable them as children to understand that they are the most, wonderful, special people on the planet. Kevin Browne, corporate parenting training and education manager, said: “When I grew up, I felt unloved. I got married. I’ve got two kids. And I love my wife. We need a care system that loves children, that shows us how to love our wives, our children, our partners, whoever they may be we need to be loved.